There’s nothing wrong with old-school. From cars to friends to music to – well, the list goes on – the feeling and attachments we have for the past are endearing. Shave soap is an old-school grooming tool. While many people think of shave cream when it comes to the stuff they put on their face to cushion and enhance their daily shave, shaving soap has been around hundreds of years (and shaving cream only since the 1940s). We’ll also discuss things to consider before you buy, how to get a superior lather from your shave soap, and examine the differences between shave soap and shave cream. Shaving soap vs. shaving cream – What’s the difference? While this post will provide you with a solid foundation of shave soaps from which to choose, it’s also important to be the savviest shopper possible. 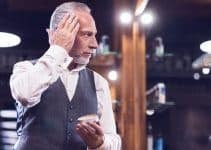 That’s of particular importance if you don’t have much experience with shaving soap; there are plenty of products out there and making the best choice for you comes down to a variety of factors. So, before you head to your favorite store (or shop online) here are some things to keep in mind before making your final decision. Triple-milling is a process of making soap that involves grating the finished soap, melting it down, and then pressing it into a new puck or bar. If you want to do it yourself you can use a cheese grater but soap manufacturers use specialized machines for triple-milling. Why is it significant to triple-mill soap? The answer lies in moisture; the less water left in a bar of soap, the milder and better the soap. While you can cure soap for weeks (even months) to allow the water in soap to evaporate, triple-milling speeds up the process. It also makes for a harder soap that, in theory, will last longer than softer soaps. Semi-hard shave soap is just as its name suggests – softer than triple-milled soaps but harder than croaps – which is a type we’ll touch on shortly. Semi-hard soaps have less density than harder soaps and probably won’t last as long. A croap is a soft or creamy soap (hence, “croap”) that is softer than other shave soaps because of the amount of moisture added to it in the manufacturing process. It’s wise to look at the ingredients before you buy any shaving product and shave soap is no exception. In most cases, shave soaps are tallow, oil, or glycerin-based. Tallow-based soaps are more traditional and favored by old-school shaving enthusiasts. Tallow refers to soap that’s animal fat-based. The prevailing thought for many years was that tallow soaps were superior to all others, but the game is changing. Oil-based soaps refer to soaps made with oils such as olive, coconut, palm, argan, etc. They’re vegan-friendly and a solid alternative to tallow-based soaps. Glycerin-based soaps are increasingly popular and are considered to be gentler on the skin than tallow or oil-based soaps. For shavers with sensitive skin, a glycerin-based shave soap is usually the best bet. Another ingredient found in some shaving soaps is fragrance, which is either natural or synthetic. Blending essential oils is one way to produce a natural scent. There are a few things to consider when it comes to ease of use: how easy it is to load the soap on your shaving brush, and how quickly you’re able to create a rich lather while maintaining the slickness and moisture that’s necessary for a good shave. While you can build a lather in your hand, it’s far better to use a shaving brush to apply the shave soap to your face. 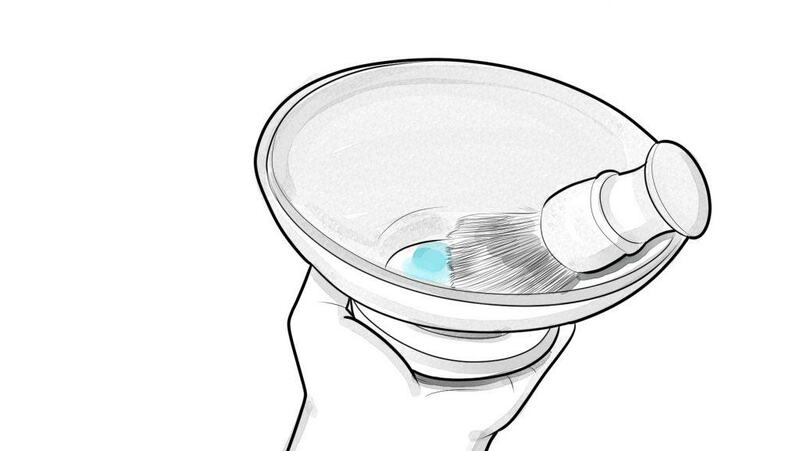 You’ll also have an easier time building your lather in another highly-recommended tool – a shaving bowl. Other advantages to using a shave brush include that it lifts the hair off of your face to help facilitate a closer shave, and it also softens your facial hair and lubricates your skin. The majority of shave brushes consist of badger hair, boar hair, horse hair, or synthetic fibers. To scent, or not to scent, that is the question. Pardon the Shakespearian reference, but the fragrance is a personal choice in any grooming product. Many shave soaps are of the unscented variety, and many of those that are scented have a mild smell that won’t last all day, like a cologne. In most cases, the scent of quality shaving soaps comes from all-natural essential oils. There are also synthetic soaps that include alcohol – which you’ll want to avoid if you have sensitive or easily-irritated skin. Two terms you’ll see a lot of in shave soap reviews are cushioning and slickness. 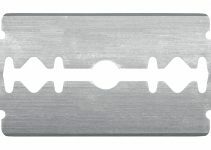 Cushioning refers to the soaps ability to allow the blade or razor head “float” on your skin to avoid razor burns, as well as nicks and cuts. Slickness is also important when choosing a shave soap. 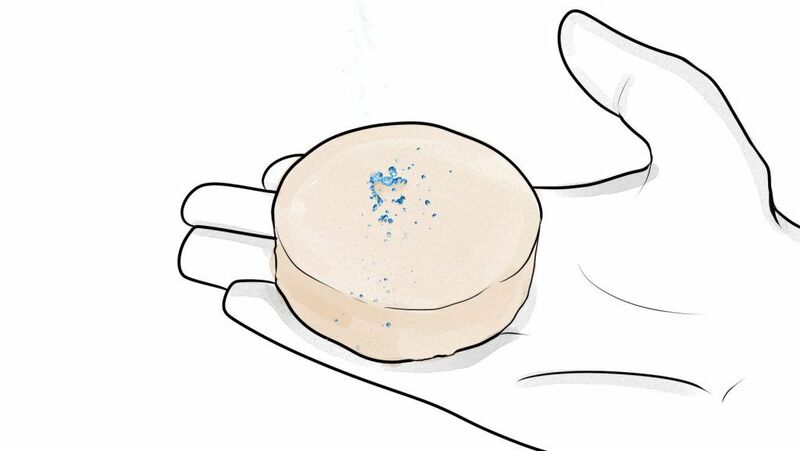 It refers to the thin layer of soap/lather that’s left on the skin that prevents friction. The slicker a shave soap, the more comfortable your shave. You’ll also get a closer shave. Of course, the price is always an important factor when buying anything. 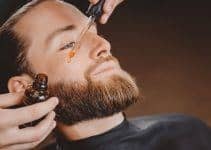 The price of shave soap is perhaps not quite as important – relatively speaking – as other shaving products because it tends to last longer than other lathering products. Generally speaking, however, shave soaps range from $5 to $25. You can expect them to last at least a couple of months no matter how much they cost. OK, now it’s time to dive into our shaving soap reviews. Taylor of Old Bond Street was established in London in 1854 and has consistently built a reputation for grooming excellence ever since. And their signature sandalwood shaving soap sets a standard that most other shaving soaps and creams can’t match. As mentioned, the Sandalwood Shaving Soap has a consistency and feel that reminds you of lotion. While other shaving soaps are a bit thin, this soap is thick and provides an excellent foundation for your razor to slide over your face smoothly. Another thing you’ll like about this soap is that it comes out of the mug softer than almost any other shaving soap. It’s packed with essential oils that soften your skin and beard as well as provide superb lubrication. Sandalwood has a reputation for being a “manly” scent with earthy tones that have a touch of cedar. Our friends at Taylor of Old Bond Street also mixed with a touch of rosemary, jasmine, rose, and lavender to give it a unique, refreshing smell. It’s not a shaving soap you can share with your wife or girlfriend, but you’ll appreciate its masculine qualities. One of the key ingredients in the Sandalwood Shaving Soap is glycerin, a naturally-derived sugar alcohol used in many moisturizing lotions. Combined with palm oil, it helps make Taylor of Old Bond Street’s classic shave soap a superior source of skin and beard lubrication. Moreover, Taylor of Old Bond Street’s products are paraben-free. Your Sandalwood Shaving Soap comes packaged in a reusable wooden shaving bowl that helps you save water. The shaving soap bowl is another example of the classy, British elegance of Taylor of Old Bond Street’s products. While the Sandalwood Shaving Soap is more expensive than some soaps, you’re not only paying for a quality product, but you’re also making a sound long-term investment. You don’t need to use a large amount of this soap to work up the lather necessary for a close shave. Note: Experts advise that you use a shaving brush with this product, both to mix it into an appropriate lather but also to apply it to your face while preparing your facial hair for your shave. Not many. Slightly more expensive than some shave soaps. The majority of the best-of shaving soap reviews include Taylor of Old Bond Street’s Sandalwood Shaving Soap and with good reason. This is a high-quality product from a company known for its excellence. If you’re serious about wet shaving, give this soap a try. Shaving doesn’t have to be a boring, same-old ritual. In fact, with the right tools, including the best razors, shave creams, and soaps, it can be downright luxurious. Enjoy your morning shave, gents! If you have sensitive skin, however, shaving can be an arduous process that leaves your skin irritated and razor-burned. And not any old razor or shave soap/cream will do. We’ve talked before about the best razors for sensitive skin. But what about shave creams and soaps? Not to worry – Proraso’s Shaving Soap for Sensitive Skin is just the product you need if your skin is easily irritated. In fact, it’s the best shaving soap for sensitive skin that you’ll find anywhere. For one, Proraso’s signature soap for sensitive skin includes oatmeal and green tea in its list of ingredients – both of which soothe and protect inflamed, easily-irritated skin. It also produces a creamy, rich lather that softens the skin while providing superb lubrication. 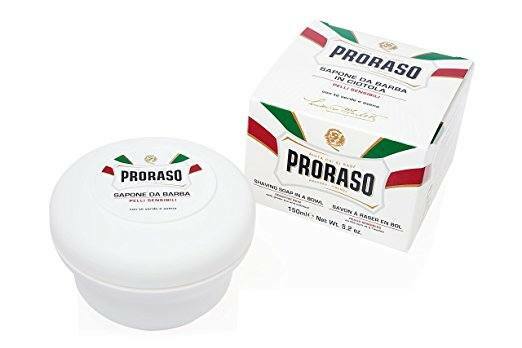 Based in Italy, Proraso has produced superior shaving products since 1948 and is one of its country’s iconic brands. 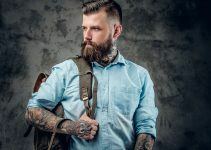 Its products have evolved over the years to feature all-natural products that including botanical extracts and natural oils that protect the skin both before and after the shave. Their products are also paraben-free, which is always a plus, and include no mineral oils or SLS (Sodium Lauryl Sulfate) that strips away the natural oils of your skin. Another thing to like about Proraso’s Shaving Soap for Sensitive skin is its scent, which has a light hint of lime and apple. It’s neither too citrusy or overpowering, but just the right mix that doesn’t enter a room before you do because it’s too strong. If you have sensitive skin, you know how touchy your morning shave can be without the right tools. But this soap, combined with the right razors and blades, will make your shaving experience much easier. Let’s talk first about the Bay Rum scent. After all, it has been a go-to men’s shaving soap scent for, well, forever it seems. History tells us that the leaves of the West Indian bay tree have been used for their scent since sailors in the 1500’s rubbed them on themselves to mask the smell that comes with being out on the open sea for months at a time. The Bay Rum scent is a wondrous and oft-used substance that dates to several centuries ago and made possible by bay tree leaves. It’s a masculine scent that’s spicy but with a hint of citrus and vanilla. The scent stays with you throughout the day but without overpowering your friends, family, and colleagues. You’ll like, they’ll like it and – not to mention – ladies will like it. It’s also a favorite scent of barber shops everywhere (and has been for a long time) so choosing Colonel Conk’s soap will enable you to help keep a shaving tradition alive. But a nice scent isn’t what separates a quality shave soap from others. It’s important, yes, but shouldn’t be the only selling point as you decide what shaving soap is right for you. It should have a lot of other positives, which is a reason to consider Colonel Conk’s World Famous Shaving Soap. Worth noting is the Colonel Conk shaving soap ingredient list, which includes avocado oil, vitamin E, and a glycerin base. Avocado oil is a natural moisturizer that smooths and soothes your skin. It’s a key ingredient in many moisturizing products and is effective in combating acne, blackheads and the inflammation that often occurs around them. Vitamin E also has moisturizing qualities but is an antioxidant that protects your skin. Like avocado oil, it’s an anti-inflammatory that reduces redness and inflammation and is great for men with sensitive skin. 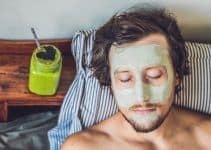 We’ve talked about glycerin already – in both shave creams and soaps – because it is an important ingredient that’s either plant or animal-based and safe for your skin. It’s plant-based in Captain Conk’s World Famous Shaving Soap and therefore safe for vegans. Glycerin provides additional moisturizing and smoothness for your skin. Something else you’ll like about the World Famous Shaving Soap is the rich lather you’ll create with a shaving brush and shaving soap bowl. You’ll truly appreciate the thick, dense lather that this soap produces. It can be hard to whip up a good lather if you’re new to shaving soap. Experienced wet shavers will have no such problem, however. 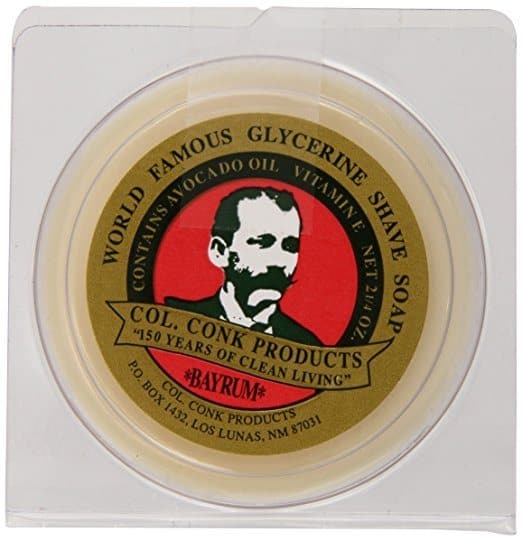 You won’t go wrong with the Captain Conk World Famous Shaving Soap. From its rich lather to its pleasing scent, it’s a product that will enhance your shaving experience. Even the name – Henry Cavendish – somehow conjures up images of old-time shaving: a mug, a shave brush, and a razor waiting nearby. In fact, the manufacturers of the Himalaya Shaving Soap With Shea Butter advise using a brush and bowl to get the best results with their soap. More importantly, Henry Cavendish’s classic shave soap fits the bill if you believe that high quality is an old-fashioned standard. Make no mistake; this is a quality shave soap. And it all starts with the ingredients. The Himalaya Shaving Soap includes glycerin – which we’ve already discussed as being an ingredient found in many moisturizing creams – and shea butter, which replenishes, moisturizes, and revitalizes dry skin. This soap will leave your skin feeling smooth and moisturized (and not oily). Not only will you get a soothing shave, but you’ll also get a lather that’s creamy and rich. It helps soften your beard to ensure a smooth shave. 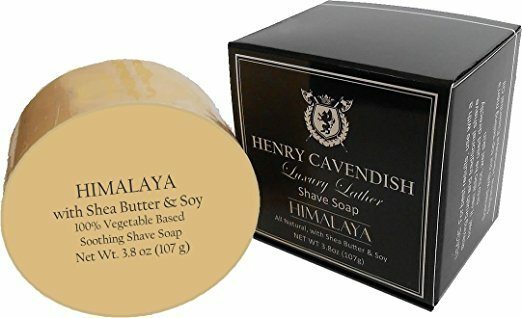 If you prefer a shaving soap with a fragrance, then you’ll love Henry Cavendish’s Himalaya perfume oil scent (which the company says women will love, too). Even better, it’s a natural fragrance that’s light and refreshing, but not overpowering. Henry Cavendish is also highly-concentrated and will last longer than most other shave soaps. Its natural ingredients make it a good choice for men with sensitive skin. There are no harmful chemicals or additives. A bit on the expensive side for its size (3.8 oz). Henry Cavendish’s Himalaya Shaving Soap with Shea Butter belongs on any reviews of the best shaving soap. It’s great for your skin, it smells good, and will last a long time. The scent isn’t the most important quality of shaving soap. Lather, lubrication, how your skin feels after your shave – yes, those are important. A shaving soap that can do all of those things and also have a great scent is worth a further look. Van Der Hagen’s Men’s Luxury Scented Soap falls into the “worth a further look” category. Van Der Hagen, thanks to its combination of cocoa butter, mango butter, and shea butter, has found the right mix of appealing scent and quality shave in its scented soap. The soap also contains glycerin, which has nothing to do with its scent but everything to do with a lubricating and moisturizing shave. In turn, it helps make the Men’s Luxury Scented Soap great for men with dry or sensitive skin (and it’s also hypo-allergenic, another skin-friendly attribute). There’s more to like about this soap, however. One of the first things you’ll notice about the Luxury Scented Soap is how quickly and easily it lathers. Your brush will be fully locked and loaded in less than a minute after swirling the mixture of soap and water around in your shaving bowl. The lather also tends to last longer on your face, especially when compared to other budget shave soaps. And that’s the other thing: you can purchase Van Der Hagen’s Men’s Luxury Scented Soap on Amazon for under $10, a true bargain for a soap of its quality. It’s worth noting that the lather isn’t as thick as it is with other shave creams but will still provide a clean, close shave. Moreover, Van Der Hagen’s Men’s Luxury Scented Soap is vegan-friendly and never tested on animals. But back to the scent. While this soap’s fragrance isn’t as powerful as, say, the Bay Rum infused soaps; it’s subtle yet noticeable. The scent may not linger throughout the day, but you’ll smell good and feel refreshed after your shave and on into your morning. It’s a scent that qualifies as mildly masculine, but not in an in-your-face kind of way. If you’re looking to buy a quality shaving soap that won’t bust your budget, then the Van Der Hagen Men’s Luxury Scented Soap is worth considering. It compares favorably to other shave soaps that cost twice as much. 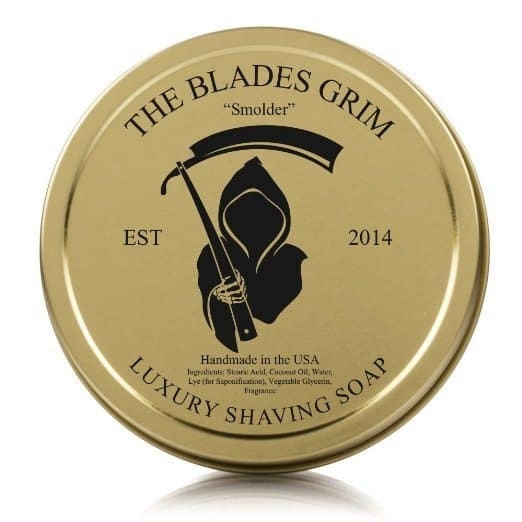 Don’t let the grim reaper logo on the can fool you – the Blades Grim Gold Luxury Shaving Soap will add life to your shave. Besides, it’s a cool logo, what with the reaperman holding a scythe that has a straight razor attached to it. That said, the cover doesn’t make the book and well-designed packaging doesn’t make the shave soap. In this case, however, the Blades Grim Gold Luxury Shaving Soap is much more than it’s eye-catching can (which, by the way, is thin and provides excellent portability). What are its attributes? Let us count the ways. The Blades Grim Gold Luxury Shaving Soap has a softer texture than other products and is just what you’re looking for if you’d like something different than the ubiquitous hard puck you get with most soaps. Blades Grim Gold Luxury Shaving Soap is handmade in America. A lot of men prefer handmade soaps because they have a certain feel and quality you don’t always get in factory-produced products. Ah, the scent. Again, while most shave soaps won’t overpower you with fragrance (and some have none at all), it’s often nice to leave a bit of scent behind after you’ve finished your shave. The Blades Grim Gold Luxury Shaving Soap feature a scent known as “Smolder,” which is one of its more noticeable attributes. Many reviewers have extolled the virtues of Smolder, with some describing it as “warm and toasty” while others refer to its citrusy qualities thanks to a hint of mandarin and orange peel. There’s also hints of coriander and star anise (the fruit of small oriental tree) to add spice. Meanwhile, the scent’s foundation lies in Tonka bean, which provides a more masculine fragrance than vanilla. The combination of all of these ingredients creates an overall scent that’s like wood smoke. It’s manly and refined. The Blades Grim Gold Luxury Shaving Soap’s list of ingredients includes coconut oil, which is great for your skin. It hydrates and cleanses at the same time to help provide a close shave. Another key ingredient is vegetable glycerin, while stearic acid – a saturated fatty acid – provides moisture and helps aid the lathering process. This soap is known for the thickness and slickness of its lather. You’ll find it easy to whip up a good lather in no time thanks, in part, to its softer texture. If you like a softer soap that smells great and provides a quality shave, then the Blades Grim Gold Luxury Shaving Soap is for you. Never mind the reaper – in this case, he’s here to help. Now that you’ve chosen your shaving soap it’s time to get down to the business of shaving. There’s more to shaving with soap than you might think; first, you need to build a good lather that ensures your shave will be clean, close, and comfortable. 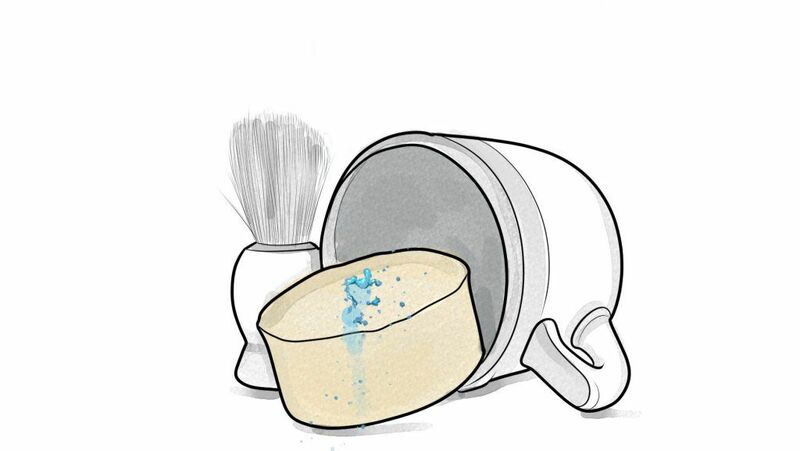 Let’s take a look at two methods for how to use shaving soap: a) with a shaving bowl and b) on your face. In both cases, we’re talking about using a shaving soap and brush. 1. 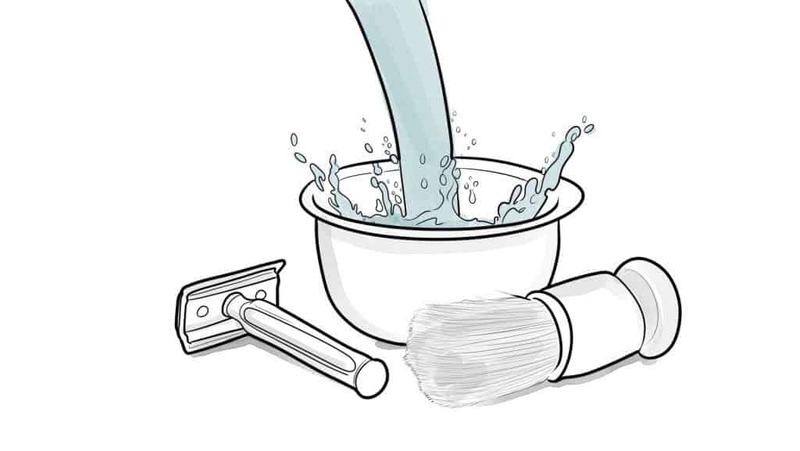 Your first step in using a shaving bowl is to fill the bowl with hot water. The water needs to be hot, but not boiling. 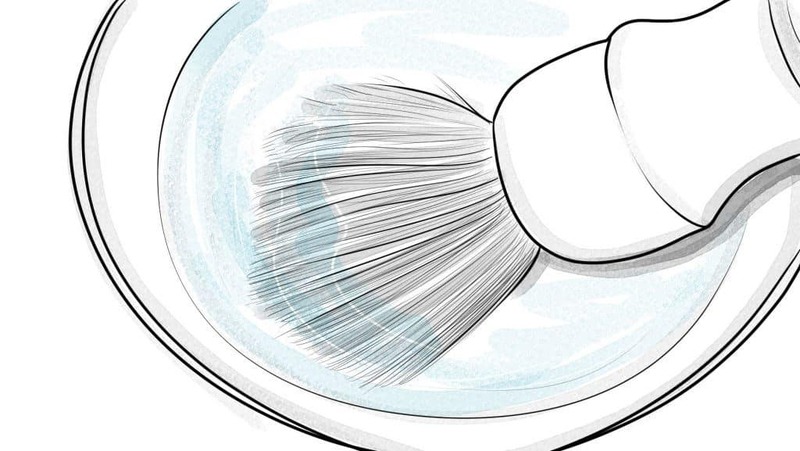 Place your shaving brush in the water and let it soak for a minute or two. You can also soak your brush under running (hot) water. 2. After you’ve soaked your brush for a couple of minutes, empty the bowl until just a tiny bit of water is left. By “tiny,” we mean just a teaspoon full. You’ll also need to shake the brush free of any excess water. 3. While you’re soaking your brush, soften your shaving soap by adding a small bit of hot water on top of it – a few drops will suffice. 4. After the soap has softened, take the brush and swirl it on the soap for 10 to 15 seconds. This is perhaps your most important step in creating a luxurious lather. 5. 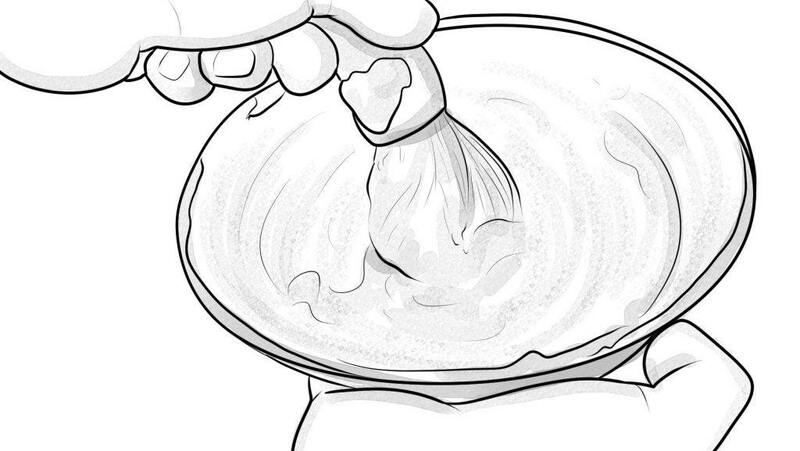 Next, take your brush and swirl it in the shaving bowl for approximately a minute. You’ll see the lather start to build from bubbly to thick. Keep swirling until the lather is no longer bubbly. If it’s too thick, add a few drops of water in the bowl and swirl again. 1. 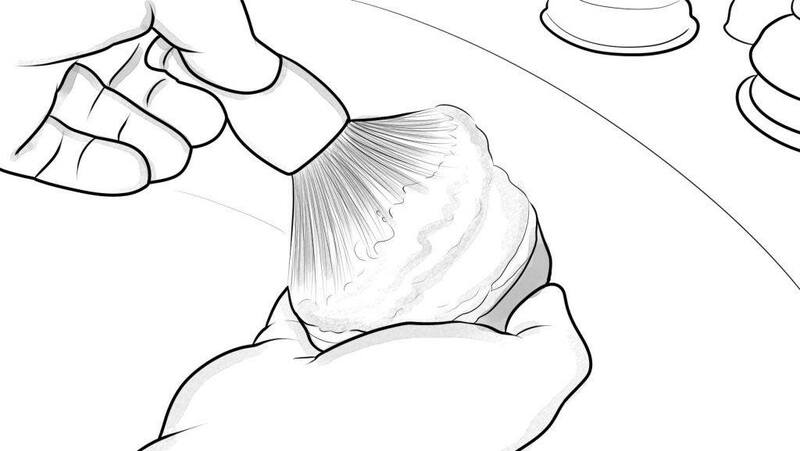 Start by soaking the brush in hot water until its bristles are moist and soft. 2. Soften the soap with a few drops of water. 3. Swirl the brush on the soap – as you did above – for 10 to 15 seconds. All you need to do is make sure that the tips of the brush have some soap on them. 4. Finally, swirl the brush on your cheeks – using a circular motion – to build up your lather. It should take about 30 seconds to develop a thick lather. If the lather is watery, swirl the brush on the shaving soap again. If it’s too thick, put a few drops of water on the tips of your brush and re-swirl on your face. Shaving soap has been around longer – a lot longer. While shaving cream was introduced in the 20th century, shaving soap has been around hundreds of years. We’re talking old, old school when it comes to shaving soap. Your grandfather and great grandfather used it, just like their grandfather and great grandfather used it before them (and so on down the line). 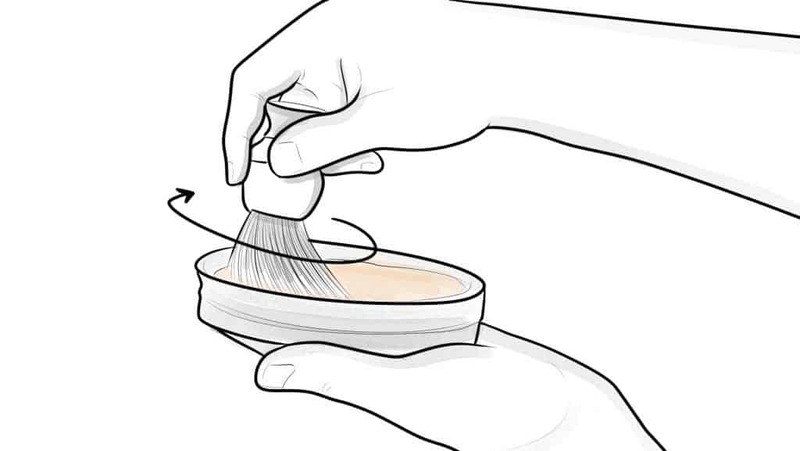 Shaving soap almost always comes in a hard puck, unlike shaving cream. Building a lather with shaving soap takes a bit more effort, although the results are usually excellent. As mentioned earlier, there’s a wide variety of shaving soaps – triple-milled, semi-hard, croaps, etc. Triple-milled is the most expensive, but many wet shavers say that it produces a dense lather that you can’t get with other types of shaving soaps. Triple-milled soaps are also harder than others, which means they can last longer. Creating a lather with shaving soap usually means adding water to it first, at least in most cases. 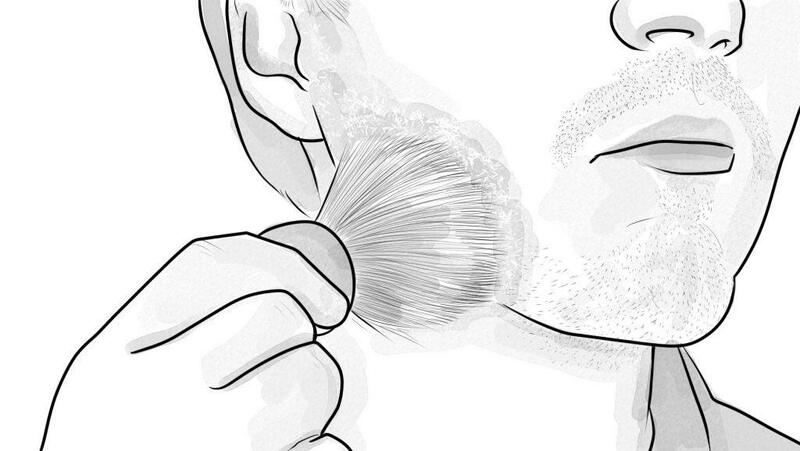 Moreover, you’ll need a shaving brush to build up the lather and apply it to your face. While there’s more of a learning curve to create a lather with shaving soap, the quality of the lather – as well as the lubrication it provides – is second to none. If you want to go old-school, then use a shaving soap with a straight razor. That’s how it was done a hundred years ago (and more), my friends. Price-wise, shaving soaps are often more expensive than shaving creams, but your initial investment buys a soap puck that can last up to four months. You can always find cheaper shaving soaps out there, although you’re gambling with quality. Regarding fragrance, shaving soaps don’t usually have the lingering scent that’s common to shaving creams. Many shaving soaps have a subtle scent – such as those that include sandalwood – but you can always use an after-shave balm or oil that provides fragrance throughout the day. The myth that shaving soaps have no fragrance simply isn’t true. When most people think of shaving cream they think of the kind that comes in aerosol cans. You know, the kind in which you press on the top and out comes the shave cream. Shaving cream has been around since the 1940s and found in almost every supermarket, pharmacy, or convenience store you can name. They’re formulated to provide you a no-fuss lather that’s often applied directly to your face. For that reason alone, shave cream is typically better for anyone new to the wet shaving game. The lather you’ll build from shave soap is, as mentioned, second to none, especially after you get the hang of mixing it in a bowl or on your face. But top quality shave creams also generate the kind of lather that deliver excellent lubrication and a superb cushion. Shaving cream comes in many different fragrances, although you’ll want to consider cream that has no fragrance if you have sensitive skin. It’s not easy to find the “best-of” anything when there are so many good choices. Make no mistake, there are a lot of quality shave soaps out there and narrowing our list down to a few wasn’t easy. But, like with all of our product reviews, we use research as our foundation and build from there. While it’s true that we don’t have the resources to try all of the quality soaps available personally, we sample as many as we can while rolling up our sleeves and digging into the research. And that research includes the reviews of others – including those of customers found on online retailers such as Amazon. In the end, it comes down to a handful of factors: quality, price, ease of use, and even ingredients. We also take into account a shave soap’s scent, although the fragrance is a small piece of a puzzle when determining shave soaps we think you’ll like. We’re confident you’ll like the soaps we’ve chosen. We hope you found this review helpful and informative. As always, we encourage your feedback – whether through comments or questions – and we’d love to hear from you if you’ve tried any of the products listed above, or if you have a personal favorite not listed here. Stay in touch! The post contains really valuable information. I have actually collected a lot of information from your post. Shave soap/cream is a complete waste of money. Simply use your favorite hair conditioner for your pre-shave and shave. It already has the necessary ingredients to nourish your skin while providing excellent glide and cushion properties. It’s not all about getting the thing done, it’s the process and experience. Plus, I don’t believe a conditioner will perform well on thick beards. Do you really think that the average man, with family responsibilities and bills, is going to spend $35 for shaving soap? Unrealistic. While I’ve been straight shaving for a couple of years, it’s always been with a shavette and only a couple times a week. I’m now ready to make the investment in a quality razor, soap and a better brush. This article is well written and dry helpful. Thank you for all the time you put into being so helpful. Good post! There are more shaving soap brands out there that I knew. I was only familiar with DR Harris, Old Bond Street, Santa Maria, and a local Dutch one called “De Vergulde Hand”. I rather enjoyed the extensive lathering explanation… I do like a thick lather but think I use a bit too much water. This is because I add the water to the brush, rather than onto the soap – something I should probably reconsider!